Bespoke landing pages are great for your outbound marketing campaigns. Include their URLs on a billboard or direct-mail shot, or in a TV, radio or press ad, and you can be confident your carefully optimised pages will effectively catch and convert the prospects these media direct to them. But in today’s world, outbound marketing is a less and less economic option for many businesses. Research shows people are no longer happy to be passively pushed products and services by companies they have no relationship with. Around 44% of direct mail goes unopened and 86% of people skip through TV ads. Instead, people increasingly expect firms to earn their trust before dealing with them. 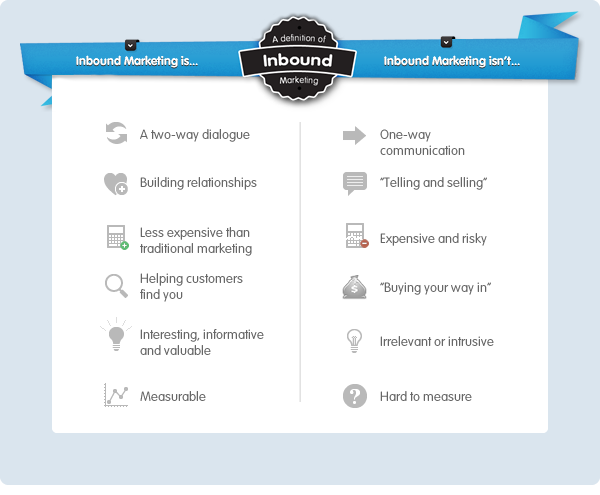 This is why inbound marketing is coming to the fore. And here too, dedicated landing pages have a key role to play. Inbound marketing is all about earning, instead of buying, people’s attention. Key to this is engaging, useful content – from blogs and white papers, through online widgets, to podcasts and webinars. To build your business crucial credibility, this content must be free. Provided it’s relevant to your target prospects, you can let these people’s likes, tweets and other social-network recommendations do the work of spreading the word for you. •Clear and focused: You can’t rely on every visitor coming to your landing page through social networks to know exactly what you want to give them. So spell it out with clear, benefit-led headlines, easy-to-scan body copy, and short, energetic calls to action. •Easy to share: Include buttons for the social networks most used by your target market. •Testable: Gauge how effective your pages are at converting social network traffic, through simple A/B testing. If a page underperforms, make edits, then send it live again. You’ll soon discover the minor tweaks that can make all the difference. Whether your marketing campaigns are outbound or inbound, effective landing pages are central to their success. And there’s no excuse for not using them. Today’s easy-to-use apps allow you to create landing pages for yourself, even if you’ve no IT or design knowledge. So what are you waiting for?